London to Helsinki . . . It's easy to travel from London to Helsinki by train and ferry, a wonderful 3-day 2-night journey across Scandinavia with a lot to see on the way. It's a great alternative to an unnecessary flight. 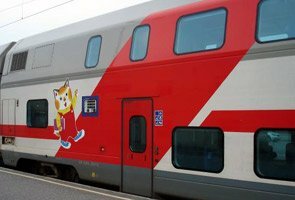 On this page you'll find a step-by-step guide to planning, booking & making a journey from the UK to Finland by train or ferry, with train & ferry timetables, approximate fares, and the best way to buy tickets. 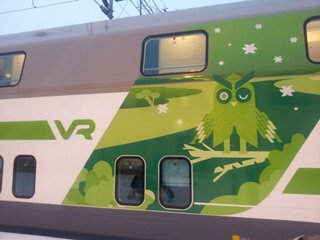 VR, www.vr.fi for train times & fares within Finland. GMT+2 (GMT+3 from last Sunday in March to last Saturday in October). Dial code +358. www.visitfinland.com. Helsinki metro, bus, tram info: www.hsl.fi. 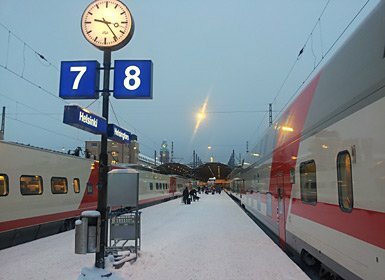 London to Helsinki by train to Stockholm then ferry to Finland: This is the fastest option, with daily departures taking 2 nights, 3 days from London to Helsinki. 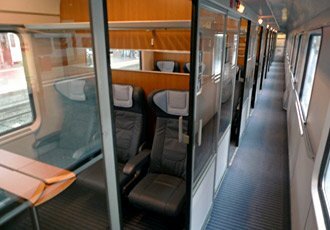 You travel from London to Hamburg by comfortable daytime trains on day 1, from Hamburg to Stockholm by comfortable daytime trains on day 2, and by luxury cruise ferry from Stockholm to Finland on day 3. You stop overnight in Hamburg and Stockholm. By all means stop off to see Copenhagen or Stockholm for a day or two on the way if you like! This route is the one shown in red on the route map below. Times, fares & how to buy tickets are shown below. 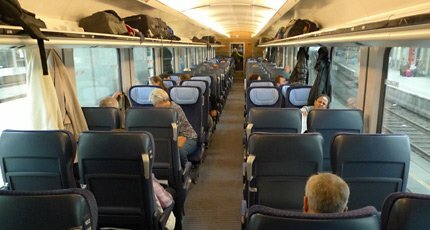 London to Helsinki by train to Hamburg then ferry from Travemünde to Finland: Take a morning Eurostar to Brussels & onward trains to Hamburg, spend the night there before taking a local train to Travemünde and the daily Finnlines ferry from Travemünde to Helsinki. This route is shown in dark blue on the route map below. Details are shown below. ...click on a route for train & ferry times from the UK, and how to buy tickets. This is the fastest option, with daily departures. You travel from London to Hamburg by Eurostar & onward trains on day 1 from just €59, stay overnight in Hamburg, then travel from Hamburg to Stockholm on day 2 from as little as €39. 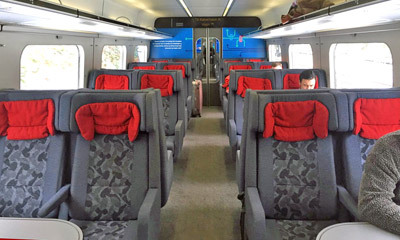 Take a bottle of wine and a good book, and enjoy a 2-day train ride across Europe on modern & comfortable trains with not an airport security queue in sight. Stay overnight in Stockholm and take the daytime ferry+train service to Helsinki next day, for as little as €39.50. 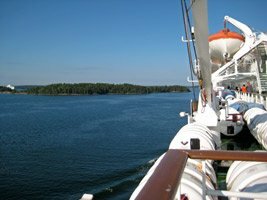 Or spend the day in Stockholm and take the overnight cruise ferry to Helsinki with a comfortable en suite cabin reserved. What's the journey like? Note that the Cologne to Copenhagen sleeper train was discontinued from November 2014. Day 1, travel from London to Hamburg using any of the services suggested on the London to Germany page. For example, you can leave London St Pancras at 10:58 by Eurostar to Brussels Midi and high-speed ICE train to Cologne Hbf, then comfortable InterCity train to Hamburg, arriving Hamburg Hbf at 21:14. See video guide to London to Cologne part of the journey. Spend the night in Hamburg. Starting with the cheapest, suggested hotels next to Hamburg Hauptbahnhof with good reviews include the Hotel Continental Novum, Hotel Furst Bismarck, Hotel Europaischer Hof, Hotel Atlantic Kempinski. Check more hotels in Hamburg. Day 2, travel from Hamburg to Copenhagen by fast Danish EuroCity train, leaving Hamburg Hbf at 09:28 and arriving Copenhagen at 14:26. The Hamburg-Copenhagen train is shunted onto a ferry for the crossing from Puttgarden in Germany to Rødby in Denmark, one of the few places in Europe where trains still go onto ferries. An interesting experience in itself! You need to leave the train and go upstairs onto the ferry during the crossing, although you can leave your luggage on the train. See photos, tips & information for the Hamburg to Copenhagen journey. Day 2, travel from Copenhagen to Stockholm by 125mph X2000 high-speed tilting train, leaving Copenhagen at 16:23 and arriving Stockholm Central at 21:36. You can check train times from Hamburg to Stockholm using www.bahn.de. Trains from Copenhagen to Stockholm cross the Öresund Fixed Link, a tunnel & double-decker road/rail bridge opened in 1999 linking Denmark with Sweden. Spend the night in Stockholm. Check hotels in Stockholm. Day 3, travel from Stockholm to Helsinki by ferry+train. Two ferry companies compete on this route, both offering luxurious cruise ferries which sail out of Stockholm past many islands into the Baltic. Consider this a cruise, see the video! If you choose Silja Line (www.tallinksilja.com, for English change locale=de to locale=en in your browser address bar), you sail from Stockholm's Silja Line terminal at 07:10 arriving Turku Harbour at 19:15, a connecting InterCity train will be waiting at the quayside, this leaves Turku Harbour (=Turku Satama) at 20:18 arriving Helsinki's wonderful art nouveau station at 22:26. In Stockholm, the Silja Line terminal is about 2.5km from Stockholm city centre, 500m from Gärdet metro station. 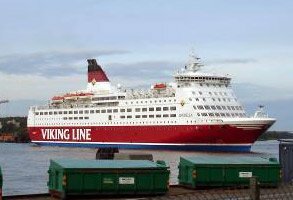 If you choose Viking Line (www.vikingline.fi), you sail from Stockholm's Viking Line terminal at 07:45 aboard a luxurious Viking Line ferry, arriving in Turku in Finland at 19:50. A connecting Finnish InterCity train leaves Turku Harbour (Turku Satama) at 20:18 arriving at Helsinki station at 22:26. See www.vikingline.fi. Alternatively, spend day 3 exploring Stockholm and sail overnight to Helsinki. Both Viking Line and Silja offer luxurious overnight cruise ferries from Stockholm direct to Helsinki - I'd suggest Silja, www.tallinksilja.com. Silja's ferry sails from Stockholm at 17:00 every day arriving in Helsinki at about 09:30 next morning (which would be day 4 from London). Viking Line sails at 16:30. It's a very scenic voyage, as the liner sails out of Stockholm past all the islands, see the video. You can have dinner in the restaurant and retire to your cabin, or party all night in the nightclub, it's up to you! 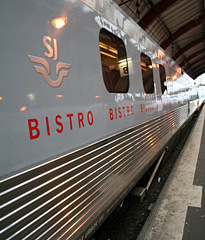 The Silja terminal is about 2.5km from Stockholm city centre, 500m from Gärdet metro station. A shuttle bus links the Cityterminal (the bus terminal next to the central railway station) with the Silja terminal. Map of Helsinki showing Silja terminal. Day 1, travel from Helsinki to Stockholm on the daytime train+ferry service. The luxurious Scandinavian ferries sail across the Baltic and into Stockholm past many pretty islands, consider this a cruise! 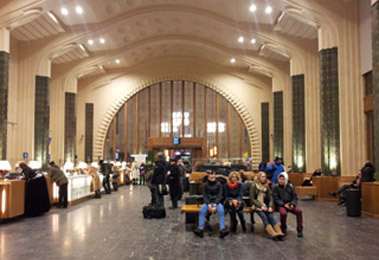 If you choose Silja Line (www.tallinksilja.com), you leave Helsinki's wonderful art nouveau station at 05:28 by InterCity train, arriving Turku Harbour (Turku Satama) at 07:47. The Silja Line cruise ferry sails at 08:15 arriving Stockholm Silja Line terminal at 18:15. If you choose Viking Line (www.vikingline.fi), you leave Helsinki station at 05:28 by InterCity train, arriving Turku Harbour (Turku Satama) at 07:47. The Viking Line cruise ferry sails from Turku at 08:45 arriving Stockholm Viking Line terminal at 18:55. Alternatively, both Viking Line and Silja offer luxurious overnight cruise ferries direct from Helsinki to Stockholm - I'd suggest Silja, www.tallinksilja.com. The Silja ferry sails from Helsinki at 17:00 arriving in Stockholm at about 09:30 next morning, after sailing past all those islands. Departures are daily, and a range of comfortable cabins is available. Map of Helsinki showing Silja terminal. If you choose this option, you obviously have to leave Helsinki the night before (let's call that day 0) but you then get a free day to explore Stockholm (on the day we're calling day 1). Day 2, travel from Stockholm to Copenhagen by 125mph X2000 tilting train, leaving Stockholm Central at 08:25 and arriving Copenhagen at 13:32. Day 2, travel from Copenhagen to Hamburg by Danish EuroCity train, leaving Copenhagen at 15:35 and arriving Hamburg Hbf at 20:22. 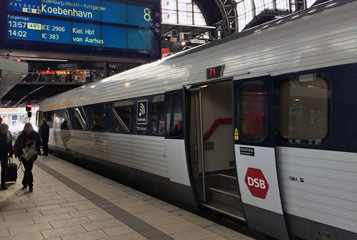 These trains go onto a ferry for the 50-minute crossing from Puttgarden in Germany to Rødby in Denmark, an interesting experience in itself! You have to leave the train and go upstairs into the ferry accommodation decks whilst the ferry is at sea, although you can leave your luggage on the train. See photos, tips & information for the Hamburg to Copenhagen journey. Spend the night in Hamburg. Starting with the cheapest, hotels next to Hamburg Hauptbahnhof with good reviews include the Hotel Continental Novum, Hotel Furst Bismarck, Hotel Europaischer Hof, Hotel Atlantic Kempinski. Check other hotels in Hamburg. Day 3, travel from Hamburg to London by InterCity train to Cologne, high-speed ICE train to Brussels and Eurostar to London, using any of the services suggested on the London to Germany page. For example, the earliest departure leaves Hamburg Hbf at 06:46, changing at Cologne Hbf & Brussels Midi to arrive London St Pancras at 16:05. Or you can leave at 07:46 arriving London 18:06 (16:57 Fridays & Sundays). Or have a leisurely breakfast and leave Hamburg at 10:46 arriving London at 19:57 (21:03 on Saturdays & some other dates). 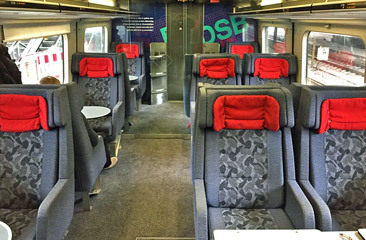 London to Hamburg starts at €69.90 each way in 2nd class or €129.90 each way in 1st class with a Sparpreis London fare from Germany Railways (DB). Like air fares, the price varies significantly from date to date and departure to departure, and prices rise as departure date approaches, so book early and pick your date carefully for the cheapest prices. 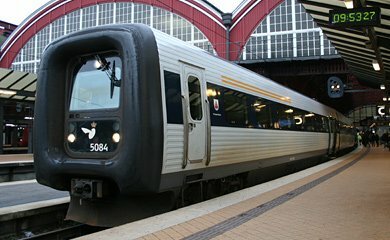 Hamburg to Stockholm starts at €39.90 each way in 2nd class or €69.90 each way in 1st class with a sparpreis fare from German Railways. Again, the price varies significantly, rising as departure date approaches so book early for the best deals. Stockholm to Turku by Viking Line ferry can cost as little as €15 each way without any accommodation, but you can add various types of private cabin from €13 upwards. Silja Line is similarly priced. Turku to Helsinki by train costs starts at €8.90 if booked in advance in Eco class (2nd class) or around €35 full-price on the day. If you take the direct overnight ferry from Stockholm to Helsinki, fares start from around €88 including a bed in a shared 4-berth with Viking Line or €111 with sole occupancy of a cabin with Silja Line. But there are whole range of cabin types and prices, just check both ferry company websites. 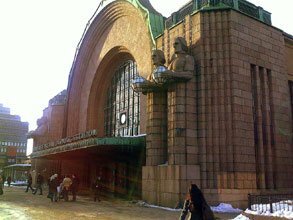 Above: Helsinki's beautiful art nouveau station, by famous Finnish architect Eliel Saarinen. I recommend registering when prompted, as you can then log in and check or re-print tickets whenever you like, from any PC. Booking usually opens 92 days ahead, you can't book before bookings open. Prices vary like air fares, so book as far ahead as you can and shop around for the cheapest departure. Sparpreis London fares have limited availability as DB (German Railways) only have a small allocation on Eurostar. 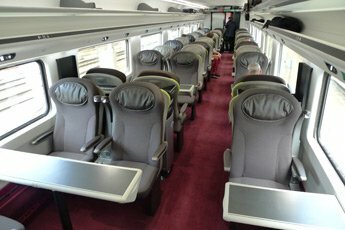 If you cannot find any cheap fares from London to Hamburg or have any other problems, try booking exactly the same trains, but using www.eurostar.com for the London to Brussels train and www.bahn.de for Brussels to Hamburg trains. Alternatively, try www.b-europe.com for London to Cologne and www.bahn.de for Cologne to Berlin. There are various ways to break this journey down! First book Hamburg to Copenhagen using www.bahn.de and print your own ticket. Then book Copenhagen to Stockholm using either Omio.com (formerly GoEuro.com, small booking fee, happily accepts overseas credit cards, you can pay in Swedish Kr, £, € and $) or www.sj.se (in Swedish Krona, no booking fee, you can usually choose a specific seat from a seating plan, but it can sometimes be fussy with overseas credit cards). You simply print out your own ticket or show it on your smartphone, or you can choose to collect tickets from the SJ ticket machines at Copenhagen station. You can check sailing dates & prices for both Viking Line & Silja Line ferries on both the Stockholm-Turku & Stockholm-Helsinki routes using the seat61 Ferry Shop, powered by Direct Ferries. Remember to select '18+' for adults and change With vehicle to No vehicle. The price you initially see is for a basic passenger place on the ferry, you can add a cabin at the next stage. When you book online you will be emailed a confirmation which you present at check-in to exchange for your boarding pass. Alternatively you can book direct with the relevant operator at www.vikingline.fi or www.tallinksilja.com (for English, change locale=de to locale=en in your browser address bar). You can book individual beds in shared cabins if you book directly with the operator, which is much cheaper than sole occupancy, that's the one thing Direct ferries can't do. Tips for using www.vikingline.fi: For English, change 'Suomi-Suomeksi' to 'International'. Now look for the 'Book' box on the right, and remember to change the selection from 'Cruise' to 'Regular voyage'. Now you can select Stockholm to Turku! 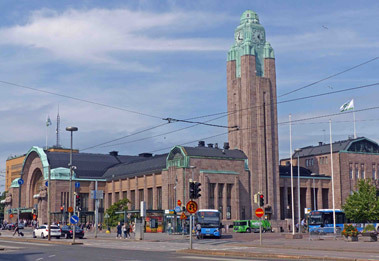 Step 4, book the train from Turku to Helsinki: If you book the daytime or overnight Stockholm-Turku ferry, you'll need an onward train ticket to Helsinki. You can do this online at www.vr.fi (click 'EN' for English). It's Turku Harbour (Satama) station that you should select. Step 1: Buy your train tickets from London to Stockholm. You can buy all these tickets through a number of UK agencies, but the best for this trip is probably Deutsche Bahn's UK phone line on 08718 80 80 66 (lines open 09:00-20:00 Mon-Fri, 09:00-13:00 Sat & Sun, no booking fee, 2% credit card charge, no charge for debit cards). Click here for a list of agencies and more info on how to book. Step 2: Viking Line tickets can be booked online at either the Seat61 Ferry Shop or www.vikingline.fi or by phone though its UK agent, Emagine Ltd, on 01942 262662. Silja Line tickets can be bought online at www.tallinksilja.com or through their UK agents, DFDS Seaways, on 0871 522 9955. If you want a custom-made trip with train & ferry travel, hotels & transfers all arranged for you, contact Railbookers. Tell them what you want and they'll advise you on the best trains, routes & hotels and sort it all out. They get positive reviews and look after their customers very well. Australia call toll-free 1300 971 52 see website. 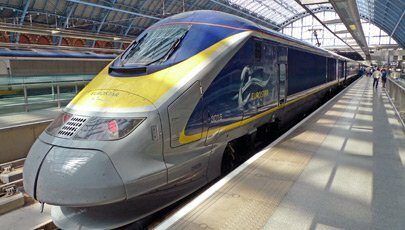 (1) London to Brussels by Eurostar. More information. (2) Brussels to Cologne by ICE3. More information. 1st class seats in traditional 6-seater compartments. Some cars are open-plan. 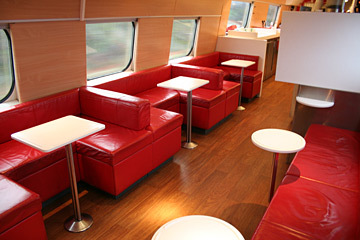 2nd class seating is usually in open-plan saloons like this, although there are also cars with 2nd class 6-seat compartments. 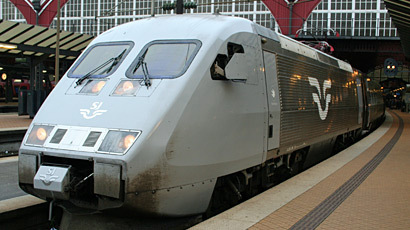 Hamburg-Copenhagen trains are operated by Danish IC3 trains like this, shown in the timetable as EC for EuroCity. See more photos, tips & information about the Hamburg to Copenhagen journey. Boarding an IC3 train to Copenhagen in Hamburg. 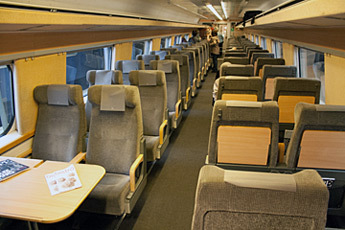 The InterCity boat train from Turku Harbour to Helsinki is a double-deck InterCity train. Note the children's play area! ...or Stockholm to Helsinki by direct overnight cruise ferry. Don't fly to Finland, cruise there! 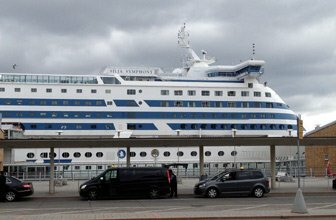 A Finnlines Travemunde-Helsinki Star class ferry. 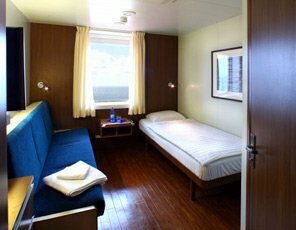 Below: A cabin on the Finnlines ferry. This leisurely option runs every day and takes 3 nights outward to Helsinki, just 2 nights inward back to London. In the outward direction it includes a day at leisure exploring Hamburg, too. Take a morning Eurostar to Brussels and onward trains to Hamburg, and stay overnight. After a day exploring Hamburg, transfer by local train to Travemünde on Germany's Baltic coast, then take the daily Finnlines ferry from Travemünde to Helsinki, a 2-night cruise. 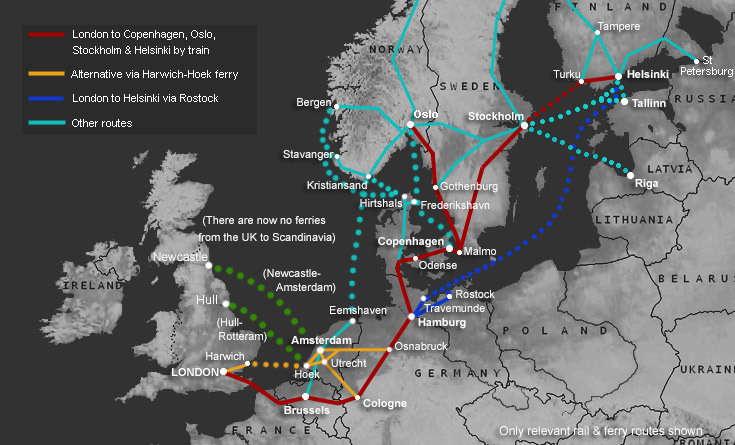 This route is shown on the route map above in red between London & Hamburg and in dark blue between Hamburg & Helsinki. Day 1, travel from London to Hamburg using any of the services suggested on the London to Germany page. For example, you can leave London St Pancras at 10:58 by Eurostar to Brussels Midi and high-speed ICE train to Cologne Hbf, then comfortable InterCity train to Hamburg Hbf arriving 21:14. See video guide to London to Cologne part of the journey. Spend the night in a hotel in Hamburg. Starting with the cheapest, suggested hotels next to Hamburg Hauptbahnhof with good reviews include the Hotel Continental Novum, Hotel Furst Bismarck, Hotel Europaischer Hof, Hotel Atlantic Kempinski. If you're on a budget, private rooms with en suite shower & toilet in the A&O Hotel near Hamburg Hauptbahnhof start at around £33 for one person or £49 for two people booked at www.hostelworld.com. Day 2 evening, transfer from Hamburg to Lübeck Travemünde Skandinavienkai Terminal by local train and bus. You take a local train from Hamburg Hauptbahnhof to Lübeck which runs every 30 minutes throughout the day, hourly in the evening, journey time 42-43 minutes. At Lübeck, leave the station and follow the signs to the ZOB bus station. Lübeck is a good place for an early dinner, there are plenty of bars and restaurants in the old town just 5 minutes walk from the bus station. Now take a bus from Lübeck bus station to 'Travemünde Skandinavienkai Terminal' (note that this is not the same stop as 'Travemünde Skandinavienkai'), the bus ride takes 28 minutes and the last bus goes around 21:00. You can check journey times from Hamburg to Travemünde Skandinavienkai Terminal at the German Railways website, just use this link to bahn.de as it has the bus times in its database as well as the trains, or you can find bus information at www.xn--sv-lbeck-95a.de. At the terminal, walk into the unassuming building next to the bus stop for check in. You're looking for a large building marked HafenHaus and with a green neon 'Check in' sign by the front door. After check-in, you go downstairs to a large waiting hall, with a bar/cafe open until 10pm, toilets and a large supermarket open until 01:30 selling alcohol and chocolate. Day 2-3, sail from Travemünde to Helsinki on the daily Finnlines ferry, see www.finnlines.com. The ship boards from 22:30 to 24:00 (day 2), foot passengers are driven onto the car deck in a minibus. The ship sails at 03:00 (day 3), arriving at Helsinki Vuosaari ferry terminal outside Helsinki at 08:00 on day 4. The ship may not be quite as glamorous as some other cruise ferries on the Baltic, but it has all the essentials: Comfortable cabins with private shower & toilet and free internet access (but not WiFi, so bring a network cable), restaurant, shop, bar, sundeck, and (naturally, being Finnish) a sauna. It's a very civilised way to travel. Day 4, transfer from the Vuosaari terminal to central Helsinki. Helsinki's new Hansa Ferry Terminal in the Vuosaari Harbour is 16km east of central Helsinki. There is a bus connection (bus 90B) between Vuosaari harbour and Vuosaari metro station. Take the metro from Vuosaari into central Helsinki, journey time 25 minutes. Map of Helsinki showing Vuosaari. 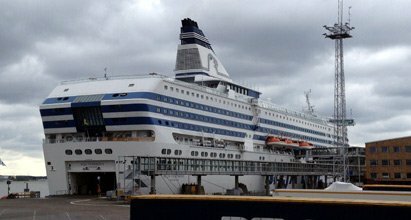 Day 1, transfer from Helsinki to the Vuosaari ferry terminal, some 16 km east of Helsinki. You can take the metro from anywhere in central Helsinki to Vuosaari station, then bus 90B from Vuosaari metro station to the Vuosaari's Hansa ferry terminal. Map of Helsinki showing Vuosaari. Day 1, sail from Helsinki to Travemünde on the daily Finnlines ferry, see www.finnlines.com. Check in is between 13:30 and 16:30. The ship sails at 17:30 (15:00 Sundays) and arrives at Travemünde at 21:00 the next day (day 2). The ship is has all the essentials: Comfortable cabins with private shower & toilet and free internet access (but not WiFi, so bring a network cable), restaurant, shop, bar, sundeck, and sauna. Day 2, transfer by bus and local train to Hamburg Hauptbahnhof. Buses link the ferry terminal (Travemünde Skandinavienkai Terminal) with Lübeck ZOB bus station, it's a short walk to Lübeck station, then local trains run every 30-60 minutes to Hamburg Hbf. Spend the night in a hotel in Hamburg. Starting with the cheapest, suggested hotels next to Hamburg Hauptbahnhof with good reviews include the Hotel Continental Novum, Hotel Furst Bismarck, Hotel Europaischer Hof, Hotel Atlantic Kempinski. If you're on a budget, private rooms with en suite shower & toilet in the A&O Hotel near Hamburg Hauptbahnhof start at around £33 for one person or £49 for two people booked at www.hostelworld.com. Alternatively, you could spend the night in Travemünde or Lübeck if you prefer, and transfer into Hamburg next morning. Day 3, travel from Hamburg to London using any of the options shown on the Germany page. For example, the earliest departure leaves Hamburg Hbf at 06:46, changing at Cologne & Brussels to arrive London St Pancras at 16:05. Or you can leave at 07:46 arriving London 16:57 (18:06 on certain dates). 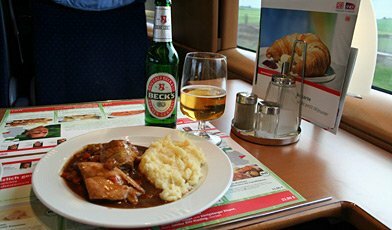 Or have a leisurely breakfast and leave Hamburg at 10:46 arriving London at 19:57 (21:03 on Saturdays & some other dates). 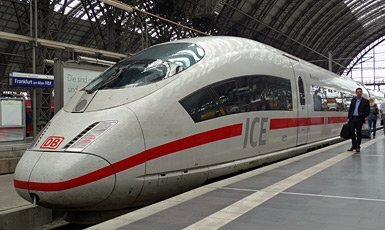 London to Hamburg by train starts from €69.90 each way in 2nd class or €129.90 each way in 1st class with a Sparpreis London fare at www.bahn.de, though the price varies. Hamburg to Travemünde by local train and bus costs only a few euros. 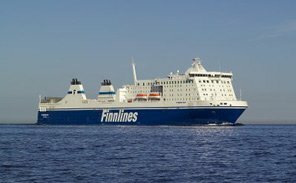 Travemünde to Helsinki by Finnlines ferry costs between €120 and €155 (£95-£120) each way in a reclining seat depending on the day and season. However, I recommend a cabin. 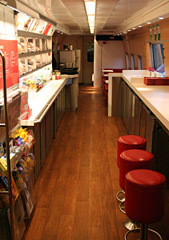 The fare including a bed in a 3-bed shared inside cabin is between €200 and €287 each way. The fare including a bed in a 2-bed outside cabin is between €279 and €413 each way. Children under 6 go free, and there are reduced fares for children 6 to 12 and youth fares for children 13-17. See the fares at www.finnlines.com. 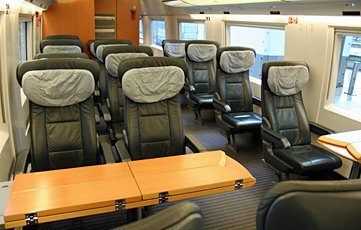 Hamburg to London by daytime trains starts at just €49 (£46) with a Sparpreis London fare, if one is available, though the price varies. Step 1, book the Travemünde-Helsinki ferry, online at www.finnlines.com. Hamburg to London leaving Hamburg at 06:46 daily or Hamburg to London leaving Hamburg at 10:46 daily except Saturdays, not certain dates or Hamburg to London leaving Hamburg 10:46 on Saturdays & some other dates. 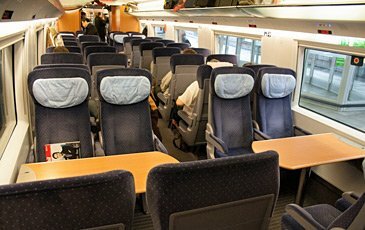 If you don't see any suitable fares from London to Hamburg using these links, split the journey, and book London to Brussels & back at www.eurostar.com then Brussels to Hamburg & back at www.bahn.de. You can buy your Hamburg-Lübeck-Travemünde local ticket at the station when you get to Hamburg (although you could try booking from London direct to Lübeck instead of Hamburg, it may well be the same price so could save a few euros). Step 1, buy your ferry ticket: Finnlines telesales number in Germany is 00 49 451 1507 443. Step 2, buy your London-Hamburg train tickets: You can buy tickets from the UK's Deutsche Bahn office, on 08718 80 80 66 (lines open 09:00-20:00 Monday-Friday, 09:00-13:00 Saturday & Sunday, no booking fee, 2% credit card charge). It's easy to check Finnish train times and buy tickets online at the Finnish Railways site www.vr.fi, for English click EN top right. Bookings now open up to 130 days in advance, and you may find it goes offline from 01:30 to 04:00 Finnish time. Mainline train fares are now dynamic like flights, cheaper in advance and on less popular dates and trains, more expensive closer to departure date and on more popular dates and trains. You can choose to print your own ticket, collect it from the self-service machines or staffed ticket counter at any main VR station, or in some cases an e-ticket can be sent to your mobile phone. 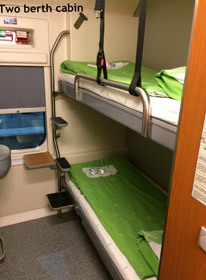 There are daytime trains from Helsinki to Oulu, Kemi, Rovaniemi & Kemijärvi, or you can use one of the time-effective sleeper trains, now equipped with air-conditioned double-deck sleeping-cars, all sleepers with cosy duvets, washbasin, soap & towels provided. Some deluxe compartments have a private toilet & shower. You can buy sleeper tickets to Lapland at www.vr.fi and print out your own ticket. 2-berth sleeper in one of VR's double-deck sleeping-cars. Some have a private toilet & shower. 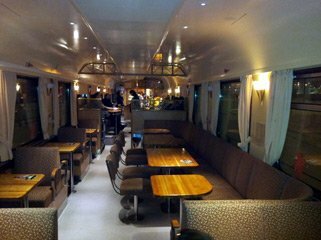 The sleeper train to Rovaniemi features a restaurant car (above) and on-board shop..
You should take a good guidebook. For the independent traveller, I think this means either the Lonely Planet or the Rough Guide. I personally prefer the layout of the Lonely Planet, but others prefer the Rough Guide. Both guidebooks provide the same excellent level of practical information and historical background. You won't regret buying one! My own book, an essential handbook for train travel to Europe based on this website called "The Man in Seat 61", was published in June 2008, and is available from Amazon with shipping worldwide. Or buy direct at the Lonely Planet website, shipping worldwide.